Trousers are pretty much a staple piece in my wardrobe lately. I feel they suit my body type more than dresses and skirts, as I’m fairly tall and have long legs so I feel trousers accentuate them. These embroidered hem trousers from New Look are perfect for all seasons and I love the floral designs on the bottoms. Wearing plain black trousers can sometimes (I said sometimes!!) be a bit boring so I love the look the embroidery gives them. They have an elasticated waist so they’re really stretchy and comfy meaning they’re an item of clothing that you can wear at any time. I love high waisted and cropped trousers and the scallop detailing on the hem of these ones is to die for! The white thread on them goes perfectly with the white tee I styled them with. This top was an absolute steal for me. It was just £2.50 (YES £2.50!!) from Primark and I absolutely love the Girl Power vibes I’m getting from it! I love graphic tees and I like how basic this one is but it also spreads a good message and I’m all about girl power. I feel the simple black and white design goes well with the trousers too, as it doesn’t draw the attention away from them too much. Do you ever do it where you change one thing about the way you style a particular item of clothing and then it just kinda… sticks? I’ve been tying my t-shirts like this a lot lately and I feel like I’ve finally found a way to wear t-shirts that suits me!! They can be worn like this with jeans, trousers, skirts…whatever you want! It makes tees so versatile and I love wearing them like this. I completed my outfit with some black hi-top converse. I’ve been loving these since I was about 12 now and I think I’m on my 3rd of 4th pair! They go so well with cropped trousers and add to the casual vibe I was going for. First of all let’s talk about the fact that if it wasn’t for Rachel I genuinely don’t think I would have appeared in this post. 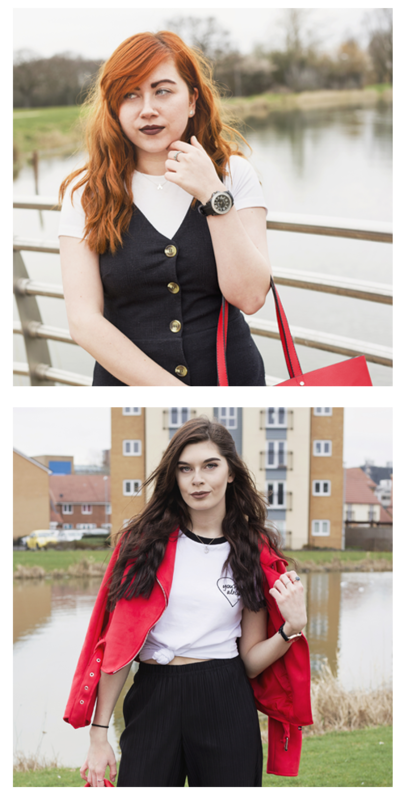 After having a mini melt down over ‘having nothing to wear’ Rachel styled me for this post and I’m so unbelievably happy with the outcome! Secondly I wanna address the fact that I am currently trying to join the ginger club but I didn’t leave the hair dye on for long enough *sighs* so this is the current situation. Moving on… I have never been one to wear trousers, until now! I’m really digging wide leg trousers at the moment, they’re comfy yet sophisticated and can be dressed to look casual, what more do you want? I originally purchased these to wear for school when I start my teacher training in September but as Rachel said, why not wear them out a little early? These trousers are the perfect size for me as where I’m only 5ft 2 I normally struggle to find ones that fit me in the leg. I love the cropped look and the ‘paper bag’ waist with the tie up belt, these trousers honestly feel so lovely to wear and I still can’t believe they were only £10! This spotty black and white cami style top goes so lovely with the trousers. I decided to tie it at the front as I felt that it gave me more of a shape than just tucking it in. I love the little ruffle detail on each side of the top it just makes it stand out a bit more and who doesn’t love a ruffle?! I am well aware that I probably should have worn a strapless bra as you can see my bra straps and it all looks a little messy. In all honesty I can’t stand strapless bras, I feel like they give me no support at all so I avoid wearing them at all costs! I decided to wear these lace up espadrilles (I know it’s shocking I’m not in Docs or Vans, who am I?) that I purchased from Linzi, a shop I had never set foot in until I got these. I’m not sure how long they’ll last as the bottoms are straw and fashion style shoes never last particularly long for me anyway. That being said I really do like them and I feel like they go really well with these trousers. What are your thoughts on wearing black and white in the summer months? Are we mad or do you like the sophisticated yet casual look? We have to say that these wide leg trousers kept us cool even though it was extremely hot when we took these photos! Absolutely loving both of your trousers in this! I’ve added a few pairs to my wardrobe recently but have yet to find a nice black pair – clearly I’ll have to look a bit harder!